Do you have any family Christmas traditions? Now that my girls are old enough to roll up their sleeves and help in the kitchen, I am hoping we will create some family lasting memories and recipes that will be passed onto their family. My family is coming into town for Christmas and we love pancakes. I can remember my dad making Aunt Jemima pancakes every Sunday morning. To this day, I still love my pancakes drizzled with maple syrup but the real stuff. Pancakes on Christmas morning, absolutley,…. Fluffy gluten free (for Mr. D) oat pancakes. 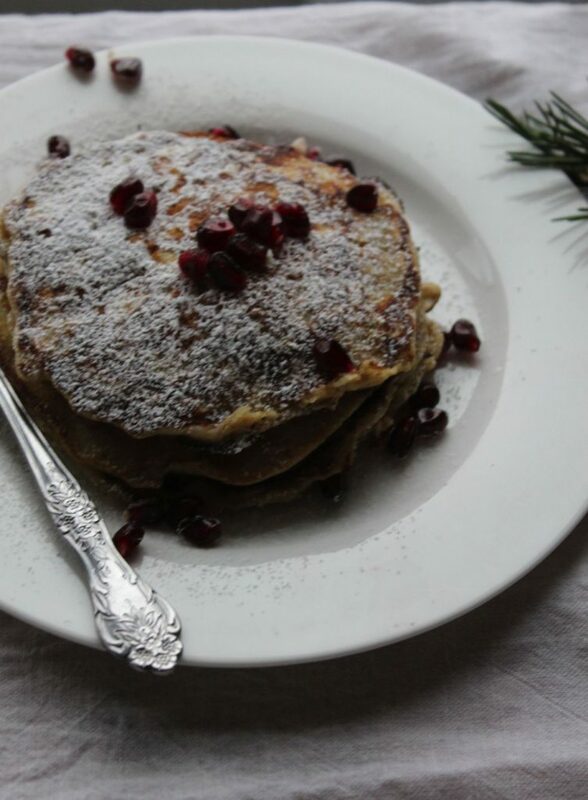 These delicious fluffy gluten free oat pancakes will be a hit during the holiday season. Oat flour adds a nice nutty sweet taste to these pancakes that you don’t have to add a lot of sugar. You can find oat flour at your local supermarket or you can simply take large flake oats and place them in a blender or food processor until they are a fine powder. If you are making gluten free pancakes make sure you read the label to ensure they are uncontaminated. To add a little Christmas touch I lightly dusted them with confectioners sugar, you can easily omit this. For a finishing touch I added pomegrante seeds. Did you know pomegranate seeds are high in antioxidants, fibre, vitamin C and potassium. This beautiful fruit has been linked to cardiovascular, cancer, and Alzheimer’s prevention. I used to always buy seeded pomegranates until I watched this video from the kitchn. In a large bowl. whisk all dry ingredients . In a medium bowl, combine oil and milk. If solidifies heat slightly. Whisk remaining wet ingredients. Whisk into flour mixture. Allow pancake batter to stand for 10 minutes. Heat non stick skillet or griddle on medium heat. Once griddle has heated add non stick vegetable spray. Working i 1/4 cup batches add batter to skillet and cook until bubbles, approximately 1 1/2 minutes. Flip pancakes and cook another minutes until golden brown. repeat. 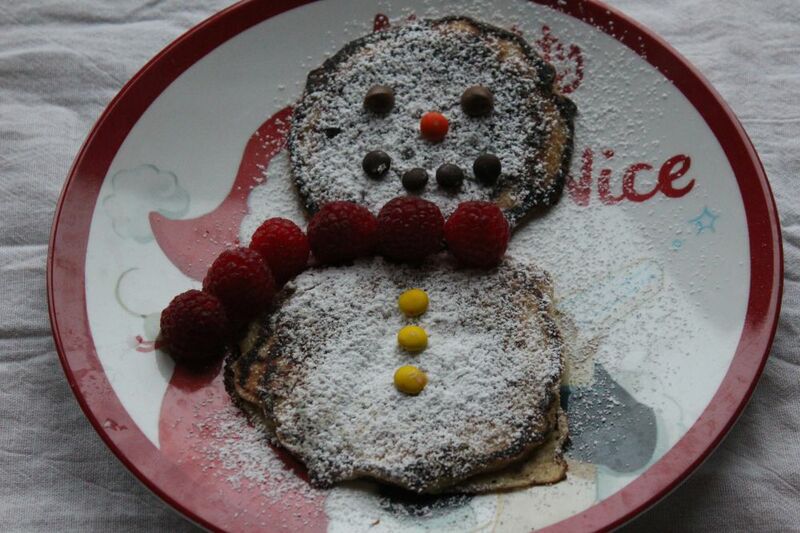 My girls eyes lit up when I turned these fluffy gluten free oat pancakes into snowmen. I placed them on their favorite Santa plates and used chocolate chips and M&M’s for eyes and a nose. They were a hit. I couldn’t take the pictures fast enough without little hands trying to sneak a chocolate chip away. If you are more in the mood for gingerbread pancakes I found this one from well plated and this one from foodess. I would make them but I am not sure my girls would be too crazy about the spices. Do you have any Christmas breakfast traditions? I would love to hear from you? Tried your fluffy gluten free oat pancakes recipe tonight and it worked out really well. Before going pizza was one of my favorite dishes and I think this comes really close. Definitely will make this again, thank you for sharing recipe. Thanks Jill. Glad you like them! 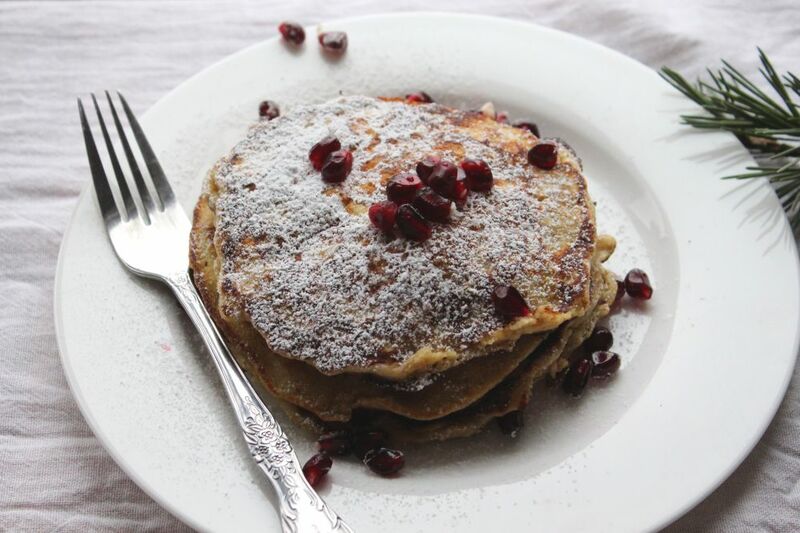 Will have to try these fluffy gluten-free oat pancakes for my family. Can I share this with my Pinterest followers? Can i post it on my blog? Thanks Robin! Of course you can share them!